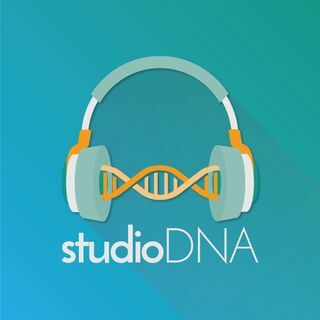 Home of everything studioDNA! Full podcast episodes from "SiftPop", "The Horrible Movie Podcast" and other studioDNA podcasts! TWILIGHT ZONE (2019) - "A Traveler"
We are #HopeDealers. This podcast is about everything related to recovery and substance use disorders. You have questions. We have answers. This is the double-cheeseburger of Interview-style podcasts. But instead of a double stack of mostly-beef patties, you get conversations with guests from the music world with a LOT of fast food references stacked on top. My goal is to serve up a great combo (see, it started already) of fun and intriguing conversations with guests that ... Maggiori informazioni are artists, musicians or performers and get caught up on NOW through their eyes. We will talk, play games and bond over odd drive-thru habits. And sure, maybe the second time you listen you actually feel some shame for having CHOSEN to even when you knew what you were getting in to. Much like that feeling you get after a late night run through a very popular taco chain but somehow that feeling doesn't stop you from coming back a third time. This is a peanut free, gluten-tolerant, with a side of sarcasm dish and its ready now for you to enjoy… or at least like fast food, at least consume. Music is meant to be listened to with friends! Aaron and Denee' listen live with you to this week's new music just like you would with a friend, scanning through with conversation. Part review, part conversation, part game show, but mostly lame food metaphors. Are you intimidated by the sheer amount of news in your world? Do you wish someone else would highlight the fun or interesting things for you? Join Aaron and Deneé for a light-hearted look at the headlines of today. Because even serious news doesn't have to be quite so serious. Recorded with a live audience every Monday afternoon on ... Maggiori informazioni Spreaker! Join in as together we Peruse the News! Two fearless friends pick a weekly topic and zoom in to uncover the beauty in life’s imperfect moments. Join Deneé and Shannon each week as they focus on how to remove unrealistic expectations using gut level honesty and infectious humor. First impressions can be wrong. On Quality Check, hosts Drew and Daniel indulge in the latest movie to hit theaters or streaming before returning to a related project to see if it holds up or falls flat. Quality Check Podcast is a biweekly podcast released every other Tuesday. Aaron and Denee's go to place to unload all the random fun that pops into their lives. Expect conversation, humor, philosophy, and anything else their random collective brain wanders to. A podcast dedicated to doing the work it takes to dig up the pop culture gold. Join Aaron Dicer, Andrew Ormsby, and a rotating group of guest gurus to review the latest movies, and dig through pop-culture looking for treasure. Aaron Dicer and Andrew Ormsby from SiftPop and Chris Atkinson from CinemaSins join forces with various guests to chat about the final season of Game of Thrones after each episode! CHUCK FREEBY - Indiana’s 2017 Sportscaster of the Year, WHME Sports Director Chuck Freeby knows the complete Michiana sports scene as well as anyone…mainly because he’s been a part of it all his life. Born in South Bend, he is a 1982 graduate of Elkhart Central High School. In 1986, he received a B.A. in American Studies from the ... Maggiori informazioni University of Notre Dame. These days, he is well known for his love of area high school sports. His passion showed for 17 years at WNDU-TV, where Chuck pioneered expanded high school television coverage with “Friday Night Flights” during football season and “Roundball Roundup” for basketball. Now, Chuck has served for over 14 years as Sports Director at WHME-TV 46 where he calls play-by-play on the high school football and basketball “Game of the Week”, various college sports events, including Notre Dame athletics on PULSE-FM and their HD.2 frequencies, and provides morning sports reports and co-hosting duties on Pulse FM. You can also catch Chuck locally in the South Bend area before every Notre Dame Football home game on WNDU-TV with “Countdown to Kickoff”. Chuck and his wife, Diane, have been married 27 years and are parents of six children: Peter (25), Christopher (24), Mary (22), Jeanie (20), Rosie (20) and T.J. (16). They live in South Bend, with their schnoodle, Skipper. COREY MANN - I was born in Benton Harbor , MI , moved to South Bend , IN in 1991, and made Michiana home. In ’94, Debbie and I got married and we live in Granger, IN! My wife cuts hair at her salon in our home, and she works with incoming students at a local Beauty College. Chloe (my oldest) is a graduate of Grace College in Warsaw, Indiana and is getting married in 2019.. Caleb (my youngest), is in 6th grade and loves Star Wars, Legos, Xbox, and family activities. He currently runs cross-country because I make him. I started in mainstream radio in 1988. Alongside waking up early for the morning show on Pulse FM in South Bend, Indiana, (92.1, 96.9, 103.1) I published my first kid’s book in 2016, with more on the way. I also host “What Else with Corey Mann” podcast on the Studio DNA Network. Oh, and more thing. I know absolutely nothing about sports. Blockbusters, limited releases, a-list, no list, big budgets, sequels; horrible movies come in all shapes and sizes and The Horrible Movie Podcast is an equal opportunity employer when it comes to bad movies. Each week Jack Altermatt (host and creator) invites a friend over to watch a horrible movie and then record their conversation ... Maggiori informazioni about what made it so terrible. The only rule is: it must be a theater release movie; no straight to DVD movies here. Great conversation with friends, celebs. Also, fun segments, some real and some make believe. Remember "Just because it's from Hollywood doesn't mean it isn't horrible!" A young Catholic married couple passionate about connecting the faith and pop culture. They spiritually analyze your favorite pop songs on the radio and focus on what is good, true, and beautiful in today’s society. This is an interview-style podcast with guests you've heard of (or have not heard of but you'll want to get to know). I'm a big fan of getting past "surface-y" talk, hence the name "What Else?". If I have a musician on the show and their #1 source of income is playing music, I'm going to be ... Maggiori informazioni finding out What Else they like to do, what their hobbies are, What Else inspires them and encourages them. The goal for this podcast is to make it feel like a couple friends getting together, having a great conversation and going a little deeper than surface level. Subscribe today! women to reach their goals. women realize their own entrepreneurial dreams. Your Movie Friend Aaron Dicer reviews a movie each week in exactly 60 seconds!